Are you a mid-career finance, real estate or accounting type who suddenly wants more from life than a fat paycheck? You don't have to leave your profession to change the world. Instead, transition to the nonprofit sector. "What the not-for-profits do is very interesting, and it's also a very secure industry, which is why people are focusing on them these days," says Suzanne Lieb, a recruiter with Howard Michaels Associates in New York City, who places finance professionals at nonprofits. "And I think since the World Trade Center [attacks], people have changed. They're looking for a way of life that doesn't involve working 70 or 80 hours a week." Any shift to the nonprofit world means sacrifices, starting with a smaller salary. 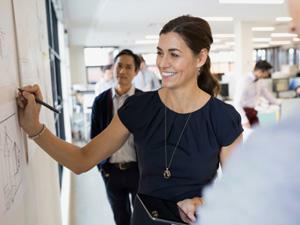 "We've found salaries are lower at nonprofits, and that's across all disciplines," says Reesa Staten, vice president of research for Accountemps, a division of Robert Half International in Menlo Park, California. Salaries for accountants are 10 to 20 percent lower at nonprofits than at for-profits. "The starting salaries [are] not significantly different, but as you [go] up to senior accounting levels, the disparities are greater," Staten says. Lieb says the largest and best-known nonprofits are most likely to pay a market rate. While salaries are rarely more than $100,000 at nonprofits, salaries of $60,000 to $80,000 are not unusual for positions where an CPA or MBA is a major plus but not required. The lowest salaries Lieb has seen were in the $45,000 range for accounting professionals with several years of experience. Money doesn't motivate some folks. Maybe your family doesn't need your salary, or you want to give back to an organization that helped a family member. Whatever your reason, be ready to explain why you're willing to work for less money. "If the pay is going to be considerably less, what draws you to us?" asks Marianne Green, assistant director of the MBNA Career Services Center at the University of Delaware. "You've got to think it through. When you give up a lot, people suspect you. They're thinking, 'Did you have a nervous breakdown?'" Nonprofits are always looking for experienced finance professionals, Staten says. "They lose a lot of talent to for-profit positions because of salaries," she says. "If you have great skills and experience and you want to take a nonprofit position, you definitely have possibilities." Lieb wouldn't send just any finance professional to her nonprofit clients. "I wouldn't typically send someone from financial services unless he had a taste of [nonprofit work] early on in his career," she says. Good candidates have a public-sector background or experience in a service-oriented niche such as law. "I wouldn't send someone used to a very structured environment," she says. "They might not do well in a not-for-profit environment." In exchange for a lower salary, the nonprofit sector often offers very nice benefits. Bill Henry, assistant director of the Patterson Park Community Development Corp. in Baltimore, took a $10,000 salary cut, but can wear shorts and T-shirts on most summer days. He dons a suit and tie for VIP meetings. The benefits at nonprofits are excellent, agrees Lieb, and often include retirement plans, family medical and dental coverage, and three weeks of vacation. "If you're a working mom, they're flexible with that," she says. "It's not as stressful and tense as for-profit finance. There's more teamwork and less competition." Most of all, there's the benefit of knowing you're helping to make the world a better place. "In the past, I've come home from days where I've had to acknowledge that no matter how tired I was and what I accomplished, [my work] served only the stockholders of the company," Henry says. "Here, we're rejuvenating and rehabbing houses, and doing programs that support quality-of-life improvements for people you can see right outside your window." "We are a business," Henry continues. "We have a board of directors just as any other business would, and we use their advice to make investments. But we're a business that plows all its money into making the community better." Learn more about charity careers.